Any questions about online shops can be asked in this thread. This includes but is not limited to shipping inquiries, questions about how trustworthy a site is, price comparisons, first press bonuses, etc. Please read each online site's HELP section prior to asking a question here. Keep in mind that it would be better to direct certain questions to the Help Desk/Human Resources department for each respective site. Use common sense. - Accepts Visa, MasterCard, Amex, and Paypal (for the US). See YesAsia's Help section for payment options for your country. - Generally sends items in bubble wrap. You may ask them to box up your package in the comments section of your check out. - Does not usually include the bonus items that Japanese online shops offer (such as posters, exclusive pamphlets, etc.) unless otherwise stated. - Does not tell you if you will receive a First Press item, or when First Press items are sold out. - This is a Japan-based store. All payments will be in Japanese Yen so prices will be based on current exchange rates for your country. - Accepts "Credit Cards and Check Cards (VISA, VISA Check Card, VISA Electron, MasterCard, Debit MasterCard, American Express, Diners Club, JCB), International Postal Money Order, Cash (Japanese Yen or US Dollars), and PayPal." - They ship by Express Mail Service (EMS), Registered Air Mail, Air Mail, or Economy Air (SAL). See shipping charges. These charges are an estimate. Actual charges may vary. - If you cannot read Japanese, there is an English option. - Accepts "VISA, MasterCard, Diners Club, American Express, Saison, DC, UFJ NICOS,and JCB." - First Press items are listed separately from Regular Press items. - This site is Japanese only. - They will not ship items outside of Japan. If you are outside of Japan, you cannot order from here unless you purchase through a middle-man. - They accept VISA, MasterCard, PayPal, Western Union, MoneyBookers, Bank Transfer. - Offers Free Shipping to selected Countries. Courier Shipping : Depending on the Courier you choose. Last edited by Cherry Dynamite; 13th December 2010 at 11:59 PM. ^hi, can you also add that which site counts towards ORICON, i think this is important to let members know whether their purchases help the artists on the chart. 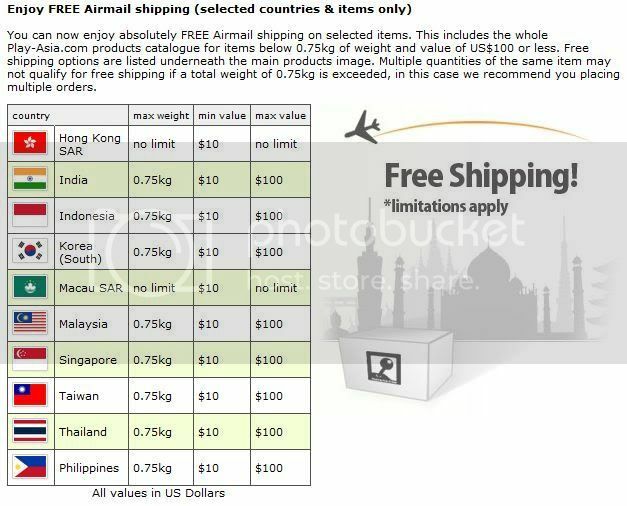 play-asia offers free shipping to selected countries(i remember canada is not eligible for free shipping). ^ Thanks I forgot about that. Rock'N'Roll Circus Boxset | PlayAsia Pre-orders? So I was just wondering if anyone else here has pre-ordered their boxset from playasia. I'm a little worried I won't get my copy since it still says it can be pre-ordered, and I don't think they will get all that many. So do you guys think they will be able to send out all the pre-orders or will they cancel some? "From 2004 to 2011, thank you Ayu for sharing your wonderful music to my life..."
Thanks for this I'm on my way to be a collector !! I don't think they'll be able to fulfill all the orders. I asked them if they can fulfill all the pre-orders and they sent me this. Last edited by Cherry Dynamite; 18th March 2010 at 03:02 PM. but they replied your queries quite fast!usually 1 day after i email them.YA usually take their own sweet time. by now, i seriously doubt that they will have enough stocks to complete all orders. it's best not to order fromn them. Anyone tell me about Amazon.co.jp delivery. I know they ships with DHL. I've preordered limited box from there and I would like to know if I will get any posters(well, I should) and will they fold them, or I will get posters in good condition? All ppl tell amazon don´t have any posters or Lucky draw. I've just read through the Mails Play-Asia sent me. And it seems like I need to send them my payment now. I'll use Western Union to pay them. and I'm not even sure if I'm going to buy from them. I'm still stuck between Play-Asia and CDJapan but the problem is I can't afford CDJapan right now and if I'm going to use IPMO I have 2 send the payment on the 27th but I still don't have enough money and I also can't afford Play-Asia right now because it seems to me they're pressuring me to send my payment now or else they won't reserve a copy for me. If I knew Ayu will release a limited box set I wouldn't have made such a huge purchase last month. haha.banacherry,you purchase cd+dvd or the limited boxset? The limited box set *-* If I don't get the money before the 27th I'll probably settle for CD+DVD. I made a huge purchase last month and then I sent 200 dollar YA certificate to my friend. So yeah I'm kinda broke. but you still have 1 more week to go.is it you going to send the money order via postage?i never use money order before.how it works? I know this sounds mean but I regret sending the Gift Certificate to my friend. I bought the gift certificates using the YA Credits from my cancelled tour goods. I just cancelled my order... So I'm guessing 1 Limited Box Set will be available.